Panel participants in the form of Slash (GUNS N' ROSES, VELVET REVOLVER), Corey Taylor (SLIPKNOT, STONE SOUR) and John 5 (ROB ZOMBIE, MARILYN MANSON) have been added to Kirk Hammett's second Fear FestEvil horror and music convention, which takes place April 10th - 12th in San Jose, CA. Fear FestEvil curator, host, and lifelong horror enthusiast Kirk Von Hammett knows not the meaning of mediocrity. For the second installment of his annual Fear FestEvil horror convention, he’s dug deeper into his crypt for the makings of another spectacular three-day event. Performing live at the RockBar Theater in San José on Saturday and Sunday, April 11th and 12th will be Nuclear Blast artists MESHUGGAH, AGNOSTIC FRONT and ORCHID, in addition to the North American debut of multicultural blues rock band BLUES PILLS. Also performing will be HIGH ON FIRE and ASADA MESSIAH. SiriusXM’s Liquid Metal host José Mangin and Nikki Blakk of Bay Area rock station 107.7 FM The Bone will preside over the musical mayhem at the RockBar, where another exhibit of some of the finest pieces in any modern collection of horror memorabilia will be on display. For details and ticket information on this unique event, visit FearFestEvil.com. 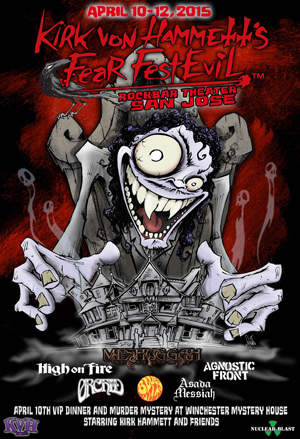 Kirk Von Hammett’s Fear FestEvil kicked off last year at San Francisco’s Regency Ballroom. The inaugural event featured an exhibition of horror memorabilia from Hammett’s world famous Crypt Collection in addition to an array of panels and guest speakers, live musical performances, and various on-site vendors. Check out photos from last year’s convention right HERE.